Make the Most: Home News! Weeks ago, on a scorching hot Sunday afternoon in August, Brian and I were supposed to have dinner with friends. But when plans fell through, we decided to go to an apartment showing instead. "Why not?" we thought. "We'll eventually be looking," we said. Brian told me to keep a poker face (there were already other offers on the table), but I had heart-eye emojis all over me the minute I walked in. It instantly felt like home. Discussing it on the stoop after leaving the real estate agent, we felt like this is exactly what we've been saving for. Well, the stars (quickly) aligned, and we bought the apartment! I couldn't believe we got the place (I'll never forget picking up a phone call from Brian while rummaging through a J.Crew sale: "Babe ... We own an apartment..."), and it was a bit terrifying to sign the contract (I swore I'd always be a renter), but we're so, so, so happy and grateful that we've found a place that hopefully will be our family home for some time. So crazy to think about! It's funny because Brian and I have talked about possibly moving abroad many times since we first met ("What are we going to talk about now?!" 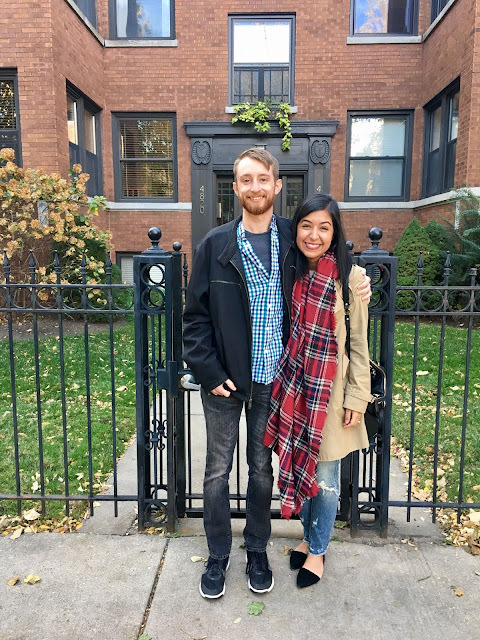 we joked as we signed the papers for our new place), but Ravenswood is a great fit for us right now. I love how it feels like a small town within a big city, and everyone seems to know each other. We still aren't psyched about long dark winters, but for at least for the next few years, we'll be bundling up and sticking it through. A big troop of family and friends helped us move last week, and we've been so grateful for every bit of this experience. We keep walking around the place amazed that it's ours. I look forward to sharing photos of the new place once we've gotten everything organized! And I'm so glad to have you close <3 <3 <3 See you soon!!!!!!!!! !